Beaches on the Big Island are unlike the beaches you can find back home. The island of Hawai’i is geologically speaking very young and there are no miles and miles of pristine white powder-sand beaches as you can find on the other, older, Hawaiian Islands. Instead, our beaches are made out of pitch black sand, crystal green sand, coarse white sand, coral, and even out of newly formed lava rocks! These are the most visited beaches on the Big Island. You can zoom and navigate the map directly and explore by region and click on the icons to get more information on each beach. You can also find these descriptions in the list below. There are only a few beaches on the rugged south coast of the Big Island, but boy, do they count! Our favorite green (Papakolea) and black (Punalu’u) sand beaches on the Big Island are both on this side of the Big Island! Read more about our Hottest Beaches on Hawaii. Guide to visiting Green sand beach (Papakōlea) on the Big Island, Hawaii. Driving directions and hiking tips for one of two(!) green sand beaches in the USA. Punalu’u black sand beach is the most famous black sand beach on the Big Island! It is located between Kona and Hilo, and most easily accessible from Volcano Village. Punalu'u beach is the most famous black sand beach of Hawaii. It is easily accessible and great for swimming, snorkeling, coastal hikes and seeing turtles. 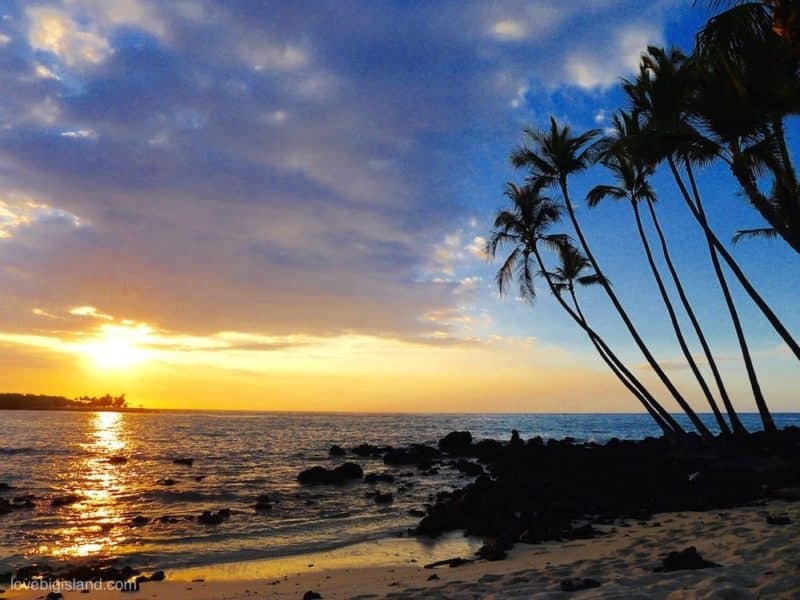 The following are the most popular beaches in Hilo and the larger Hilo area. You can also read more in details about the beaches *in* Hilo. New black sand beach with strong current and unpredictable waves. This beach was covered by 15 meters of lava in 1990, and is a very interesting place to visit. 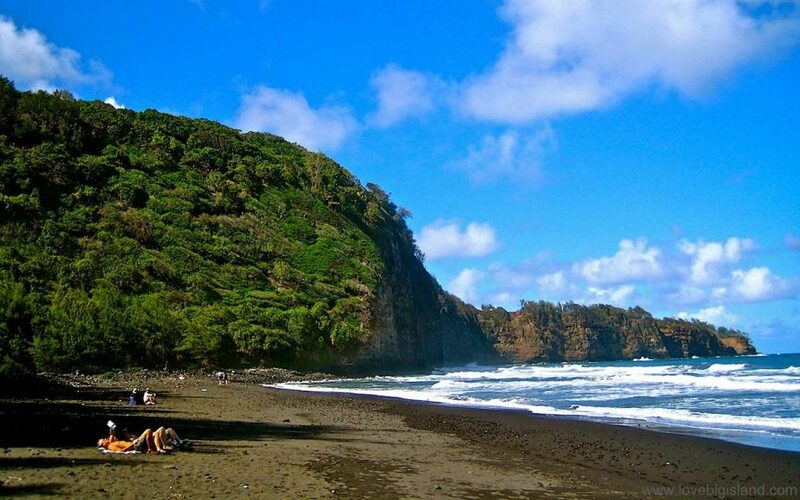 Kaimū beach is one of the newest black sand beaches on the Big Island. 5 reasons why we think everyone should visit at least once + directions to Kaimu. Very popular surfing destination in east Hawaii and, since the 2018 LERZ eruption, also the location of the stunning Pohoiki black sand beach. Picnic tables and a playing ground are also present. Isaac Hale (Pohoiki) Beach Park was almost overtaken by lava (in August 2018) but now has a beautiful & brand new black sand beach, lagoon and thermal ponds. Also know as Pu’ala’a County Park. No sandy beach but thanks to volcanic energy the water here is warm. Perfect for a warm swim on a cloudy day. Stay away during weekends because the pool gets crowded and the water dirty. Read more about the Ahalanui hot springs on our website. The Ahalanui hot Ponds in the Puna district on the Big Island, Hawaii. The pool is partly separated from the Ocean to create a lukewarm swimming pool. No beach, but a perfect place for snorkeling! These are deep (up to 10 ft) tide pools with lots of fish in between the lava rocks. Take shoes for walking to the water because you will be walking over sharp lava. Read more about the Kapoho tide pools on our website. Richardsons is the black sand beach closest to Hilo, and the #1 place to snorkel south of Hilo. There are showers, bathrooms, picnic areas, and a lifeguard. The beach and swimming area are protected by a natural lava rock breakwater. The black sand beach closest to Hilo. Richardsons is a good place to go snorkeling and swimming with tide pools, calm water and picnic area. Great for kids!. A rocky shoreline, many picnic tables, tide pools and abundant sea-life make this a prime snorkeling destination if you are spending time in Hilo. Don’t forget to bring lunch for a nice picnic. Protected white sand lagoon lined by black lava rocks. Restrooms and a picnic area are available. A good beach to come swimming, snorkeling, fishing or a picnic. Carlsmith beach park (on the Big Island of Hawaii, also know as Four Miles) is one of our favorite places to swim and snorkel close to Hilo. Many turtles. Good family beach with lots of open space and a rocky shoreline. Good for surfing, snorkeling, swimming and fishing, with a large picnic area and restrooms. Be careful in the water because there can be strong rip currents during high surf! A good place to bring your family. With picnic areas, grassy areas, shallow waters shielded by breakwaters, and even the occasional ice cream stand. There are also tide pools that you can explore with a snorkel. Mokuola (Coconut  Island) is a small island in Hilo bay with a few small beaches and a large grassy area with several picnic tables. Access is easy and you can spend a few hours easily relaxing and swimming in the protected bay, enjoying the views and of course looking at all the kids making a show off jumping from a nearby 20 ft tower. 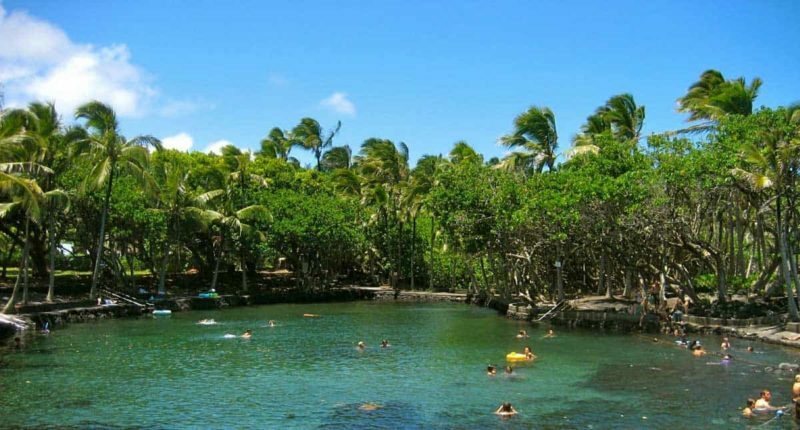 Coconut Island in Hilo Bay is a good place to hang out and/or swim for a few hours. Two small beaches, a grassy area, and a 20 ft tower used for jumping.. The stunning white sand beaches on the Kohala coast come very close to what we call paradise. Throw in a few black sand beaches surrounded by 1000+ ft high cliffs and you know why this part of the Big Island is the beach lover’s favorite! Read more about this beach in our guide to Waipi’o valley. Overview of Waipi’o Valley from the ‘opposite’ side. You can see the steep Waipi’o Valley access road, the black sand beach and taro fields. Difficult to access, secluded, black sand beach with great views. The beach more often than not consists of large (fist-sized) stones, the water is often murky po there can be strong currents. This all means that this is not a good beach to go swimming or snorkeling. To get to the beach from the parking lot you have to descend 400 vertical feet to get to the beach. The path down to this beach offer GREAT views and for this reason is one of our 5 favorite hikes on the Big Island. We also have dedicated a complete page to Pololu Valley. Rocky beach good for snorkeling and diving. In the park you can also find restrooms, picnic tables, and BBQ grills. Great beach for a sunset BBQ! Technically an abandoned harbor and not a beach. This is a good spot for snorkeling and diving. You can find old sugar mill equipment on land and a few abandoned shipwrecks in the water. This beach is protected from high surf by an offshore reef and the harbor just north. This makes it a great family beach. In the beach park you can also find a picnic area, camping (with permit) and BBQ facilities. This beach is also right next to a national park and a national historic trail! Next to the Spencer beach park you can find one of our four national parks on the Big Island: the Pu’ukohala Heiau National Historic Park, and this beach park is also the starting point of a 15 mile stretch of the Ala Kahakai National Historic trail, which leads to the gorgeous ‘Anaeho’omalu Bay. Kauna'oa Beach (Mauna Kea Beach) is one of the prettiest white sand beaches on the Big Island of Hawaii. A family beach good for sunbathing and snorkeling. Hapuna Beach is one of the best beaches on the Big Island for swimming. This 1/2 mile white sand beach is regularly voted among the ‘best beaches in the world’. There is a wide (in the summer months up to 200 ft) white sand beach that slopes gradually into the ocean – perfect for playing in the waves. On the north and south side of the beach are good snorkeling spots around the rocks. Hāpuna beach on the Big Island is consistently voted among the 'best beaches of the world'. It also is one of our favorite beaches on Hawaii because of the long white sand beach, easy parking and good facilities. Great for swimming and snorkeling, some hikes available. Waialea beach (69 beach) on the Big Island is very popular during the summer months because of the sun, shade and good snorkeling. Close to Hapuna beach. This beach is protected from high surf by an offshore reef. It is great for swimming, diving, and snorkeling. The sand is ‘salt-and-pepper colored, and the beach is located on the ocean side of the outrigger Waikoloa Resort. Beautiful salt-and-sweet water bay with good swimming. Most of the ocean access is private property, but there is a public access beach. If the tide is out the bay is dotted with tide pools that are perfect for snorkeling. Kuki’o Beach is a long, white sand, beach with many green sea turtles. Many lava rocks above and below the water make it not a good beach to go swimming. Protected beach best suited for families with young children. Actually no beach but a lagoon that has virtually no current or waves. No snorkeling. This State park includes 3 beaches: Mahaiʻula Beach, Makalawena Beach, and Kua Bay, each discussed below. The beaches are secluded and beautiful and offer a great day-trip from Kona. They are white sand beaches with blue-green water and are surrounded by pitch-black lava fields. The 3 beaches in the Kekaha Kai state park are (from North to South): Maniniʻowali Bay (a.k.a. Kua bay), Makalawena beach and Mahaiʻula Bay. Image adapted from google maps. Access is difficult and not for the faint of heart (lava fields and rocky winding road). If you have rented a car you should check with the rental company to see if you can go here. Kua bay is one of the best white sand beaches on the Big Island. A magical small and secluded beach just north of Kailua Kona best visited during weekdays. Pretty white sand beach lined with coconut palms. A lava shelf just offshore makes this beach not an easy place to swim, but if you are planning to relax and enjoy a picture-perfect beach, this is a perfect place! Mahai’Ula beach is the most southern beach in the Kekaha Kai State Park on the Kona coast. One of the prettiest white-sand beaches of Hawaii. Only reachable by a strenuous 1-mile hike beyond Mahai’ula Beach Park. Mahaiula beach is the southernmost of the three beautiful Hawaii Big Island beaches making up Kekaha Kai State Park. Aiopio Beach is a small beach with protected, calm waters. It is part of the Kaloko-Honokohau National Park and most easily accessible from the Honokohau small boat harbor. If you have booked a boat tour that departs from this harbor you should try to arrive early and have a look at this small beach. The first Kona airport closed in 1970 leaving a runway that now serves as parking lot for this beach park. The ocean is often rough here, but if you stay in Kona, this is the perfect place to bring food and watch the sunset! Kamakahonu (king kam) beach in downtown Kona on the Big island is a popular spot for snorkeling and swimming. Good beach for families with small children. Also know as Magic Sands because the sand disappears temporarily from the beach with rough surf. There is a good shore break for surfers here, and a lifeguard is always on duty. Showers, a bathroom, and volleyball net are present. Dark-gray sandy beach with a reef just offshore and a very good place for snorkeling. Parking, showers, picnic tables, and restrooms are present, as well as some shade. This is one of our 3 favorite snorkeling spots on the Big Island. There is no sandy beach, but this is a very popular destination for snorkeling and kayaking. Spinner dolphins often visit the bay. You can visit the monument erected in honor of Captain Cook via a steep trail or with a kayak over the water also. A permit is required for kayaking. More information about permits and snorkeling at Captain Cook. This is the historical site of one of the last Hawaiian fishing villages. They color of the beach is gray and it is made out of lava and coral. It is possible to camp overnight. Restrooms, picnic tables, and showers are available at the park. Take care of yourself and you family while you are in or close to the ocean! As peaceful and inviting as the ocean may look, and often is, serious accidents can happen at the beach. Strong, hidden currents can overpower even the most seasoned swimmers. Walking on coral may harm your feet and damage the coral. Sea urchins also live in crevices between rocks and coral, and you don’t want to step on one of those! Never turn your back to the ocean, and always follow posted signs. Some beaches may be closed because of high surf and/or dangerous currents. You can find up-to-date information on possible hazard ratings of the Big Island beaches at this website of the county of Hawai’i. The Hawaiian sun can be very strong! Be sure to apply sunscreen generously and often to prevent a heavy sunburn, Wear a shirt if you go out snorkeling. though the crime rate in Hawaii is low visitors should be as cautious as they would be at any other destination. Do not lock valuables in your vehicle. If you must, pack items out of sight before parking. Please make sure to clean up after yourself. Hawaiian beaches can be different than the beaches you know from back home: local laws can be different, our sun tends to be stronger because we are closer to the equator, sand on our black sand beaches (made out of lava!) can be VERY hot, and, most importantly, all Hawaiian islands are surrounded by beautiful but fragile coral reefs. These 7 tips will make sure that you are well prepared for your visit to our paradise-like beaches! Bring a hat to protect your face and your eyes. Sunburns can cause premature aging and UV rays can also damage your eyes. Prevention is the key. Bring a reusable water bottle to stay hydrated and minimize plastic waste. Wear shoes or flip flops. Sand on our beaches gets HOT (especially the black sand!) and sometimes sharp pieces of shells and coral can cut your feet. The Hawaiian sun is intense. Lip balm with a high (30+) SPF gives extra protection to your most vulnerable pieces of skin such as your lips, earlobes, etc. Smoking and drinking alcohol is illegal on beaches and in state parks. If you want to enjoy any of those things, please don’t do it on the beach. Beaches on the Big Island are not as crowded as they are on the other Islands. Especially if you go to the more remote beaches during weekdays it is possible that you find the beach all to yourself. This also means that some beaches have very basic facilities. Be sure to take plenty of water and sunscreen. Going to the beach offers many methods of recreation. You don’t need to be a fan of tanning to enjoy yourself. Take your snorkel gear and you can spend hours under water swimming between fish in every color of the rainbow. If you like playing in the waves, why not go body surfing or take along a bodyboard, SUP board or surfboard? You will never have to get bored on the beach – even if you travel in a big group! If you are not the sun worshiper your travel companion is, bring a book, good food and drinks, snorkel gear, or whatever you enjoy doing, and do your thing. Let me reiterate those last two important words: “snorkel” and “gear”. The waters around the big island are teaming with beautiful life, make sure not to miss it! Read more on snorkeling and buying or renting gear.